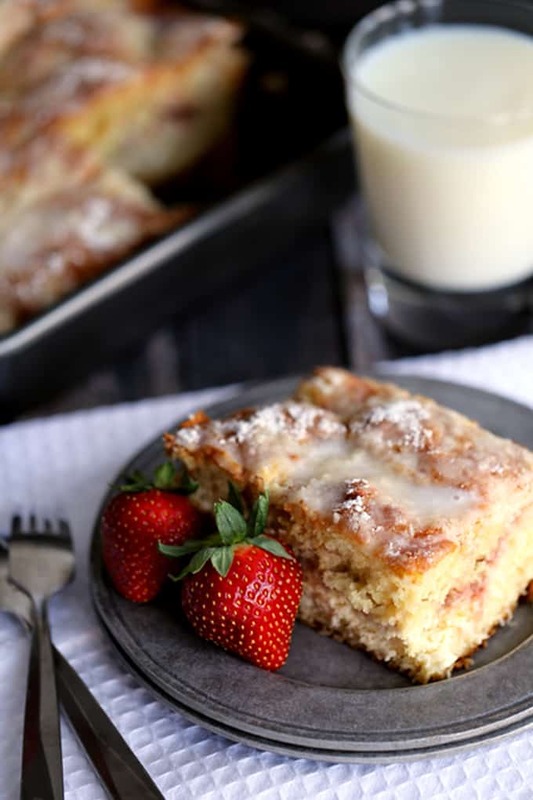 This Strawberries and Cream Coffee Cake will have your family rolling out of their beds and making a beeline for the kitchen in record time. A thick swirl of cream cheese and strawberry jam is sandwiched between two layers of light as air coffee cake. This breakfast treat is then topped with a sugar and butter topping before being baked and then drizzled with a powdered sugar glaze. What’s your breakfast of choice? For me, it’s usually a protein shake as I’m getting the menagerie their breakfast, unloading the dishwasher, feeding the dog and basically just overseeing the general mayhem of the morning. A glimpse of the typical weekday morning at our house prior to heading out to school. By the time the weekend rolls around, I’m ready for something with a bit more substance that can be enjoyed at a leisurely pace. Bonus points if it’s something I can make the night before and simply sit down to enjoy with the rest of my family. 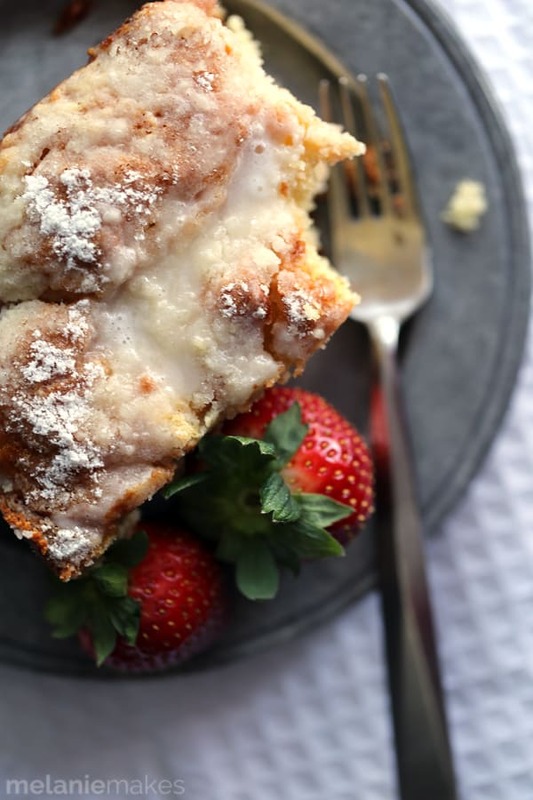 This Strawberries and Cream Coffee Cake definitely falls into that category and was eagerly polished off by the five of us. A thick swirl of cream cheese and strawberry jam is sandwiched between two layers of light as air coffee cake. This breakfast treat is then topped with a sugar and butter topping before being baked and then drizzled with a powdered sugar glaze. 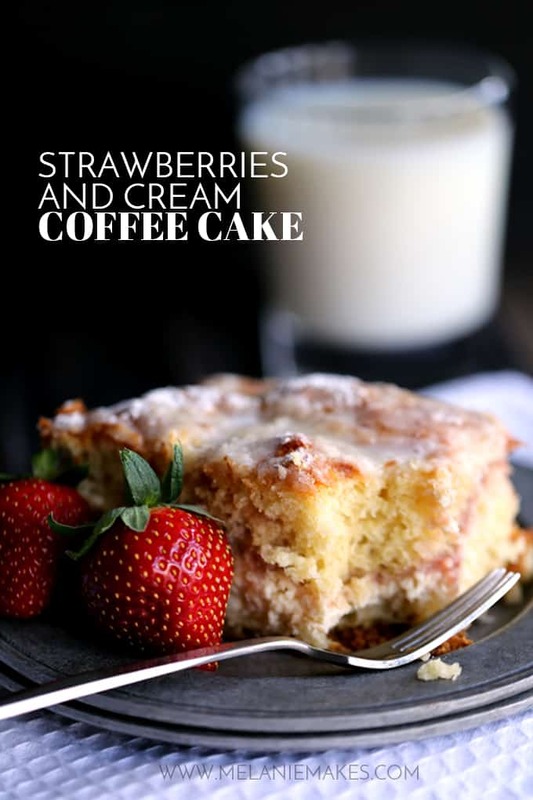 This Strawberries and Cream Coffee Cake will have your family rolling out of their beds and making a beeline for the kitchen in record time. Make ahead coffee cakes like this one are always hit at our house whether it’s just our family around the table or we’re entertaining house guests. In fact, this rich Chocolate Chip Sour Cream Coffee Cake, this bright Blueberry Almond Lemon Coffee Cake and this fall inspired Caramel Apple Cheesecake Coffee Cake are all on my go-to breakfast and brunch list. Looking for other strawberry inspired breakfast recipes? Can you imagine waking up to these dreamy Homemade Strawberry Poptarts, super fun Strawberry Monkey Bread and restaurant worthy Strawberry Crepes? I’d invite anyone to make these for me any day of the week. In the bowl of an electric mixer, cream together cream cheese, sugar, egg and vanilla on medium speed until well combined. Scrape filling into a separate bowl and set aside. Add egg, vanilla and yogurt and mix until combined. Add flour, baking powder, baking soda and salt and mix until just combined, being careful not to overmix. Divide cake batter in half and spread half onto the bottom of a greased 9x13 pan. Spread cream cheese filling evenly over top of cake batter. Microwave strawberry jam for 1 minute or until thinned and easily spreadable. Place dollops of jam over cream cheese mixture. Top with dollops of remaining cake batter. Using a knife, swirl layers of cake batter, cream cheese filling and jam together. In a small bowl, stir together sugar and flour. Using a pastry blender, cut butter into sugar and flour mixture until pieces are the size of peas. Sprinkle topping over top of cake. Bake for 40-45 minutes or until toothpick inserted into middle of cake removes cleanly. Allow to cool completely. In a small bowl, stir together powdered sugar and milk. If necessary, add additional milk to reach drizzling consistency. I originally shared this recipe as a monthly contributor post at Lil’ Luna, here. This is a must make with all our fresh strawberries! Thanks so much for the link love. I can't wait to try this wonderful recipe. Happy weekend! I love making a big brunch, and normally I got for the savory route, but these are some gorgeous looking coffee cakes! I love testing new recipes so I can't wait to give these a try. I promise this will be a crowd pleaser, Gwen - let me know if you give it a try! 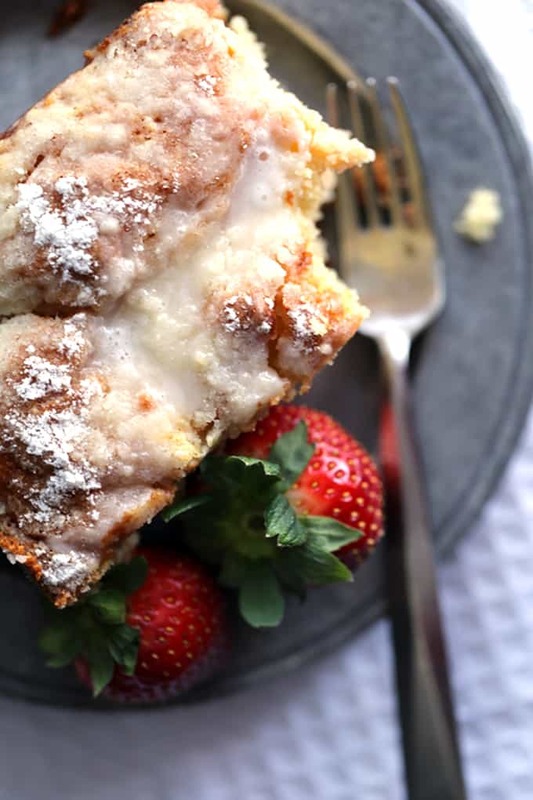 Delicious.....a strawberry cheese danish in coffeecake form! I didn't have yogurt on hand so I substituted sour cream (never a bad thing!). I'm so glad I stumbled onto your blog. So glad you enjoyed it, Sandra - thanks so much for letting me know! Hellooooo, my new breakfast! This sounds so good, Melanie! I would jump out of bed every morning if I get this beautiful cake! I love your take on the classic coffee cake. A strawberries and cream version sounds so divine! Thanks, Thalia - it definitely was a hit at our house and I love that I usually have all ingredients on hand. I'm thinking of making it again tomorrow! Oh what a lovely cake! I love all things strawberry and cream! Oh My Gaaa Melanie, Love Love Love this. Seriously yum. I am daydreaming about this melting in my mouth! Yes, you have me fantasizing about food. Thank you, Stephanie! Believe me, this coffee cake is worth the day dreaming - so good! YUM! I am SO excited for Spring to roll around so we can eat strawberries again! Me too, Trish! And to pay a decent price for them as well! Are we foodie soulmates?! This looks SO good! My breakfast is usually coffee + whatever gluten-free thing the kids didn't eat from their breakfasts. Glamorous, I know. I'd much rather have this gorgeous coffee cake! We do lead rather glamorous lives, don't we? I've gone through the english muffin and peanut butter phase! But yes, you want a slice of cake, too! Love this new take on coffee cake! I bet that filling is amazing. It definitely is the showstopper of this breakfast cake, Nicole! YUM! Hello breakfast on saturday. Absolutely! Let me know if you try it, J! Yes and yes! Yes, I totally understand the rushing to get everyone ready and yes, to this delicious coffee cake! Can't tell you how much I've enjoyed having two days off of school this week due to the cold. No more rushing! My mornings look exactly the same, but instead of a smoothie I have to have my coffee. This coffee cake looks delicious! I wish I had a slice right now! I'm gonna make this asap! I just love coffee cake and this one looks perfect for our Sunday morning. Pinned. Coffee cake is always a great choice in our house for Sundays as no work is necessary. Let me know what you think if you give it a try, Cyndi! 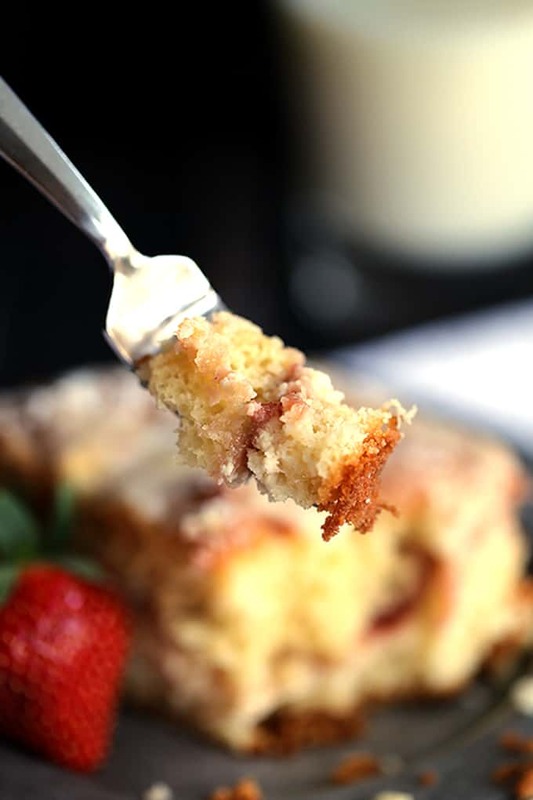 I love a make the night before breakfast, and it doesn't get better than coffee cake! Make sure to cut yourself a big slice, Miranda! This looks fabulous! I would definitely race to the kitchen for this coffee cake! I have been craving a coffee cake lately and this one looks amazing! It's definitely a new favorite at our house, Pam! I have no doubt he'd love this, Kristen! This is such a beautiful breakfast! It would definitely be the perfect thing to gather the family around the breakfast table. My hubby in particular is crazy for strawberries so I know he'd adore this! A perfect choice for your family then, Faith! My usual breakfast is oatmeal. Almost every morning. But, then weekends. I want ALL THE PANCAKES. OR, this coffee cake! That cheesecake swirl? I DIE. Pinned! Oh the swirl - definitely worth the weekend splurge! And you know I laugh over you and your pancakes! My family would LOVE this coffee cake version, thanks so much for sharing the recipe.